Bethlehem 1st Federal Credit Union has a great new opportunity for members to earn a higher interest rate on their savings! Introducing our new Money Market Share Account. With our Money Market share account, you can earn higher dividends without losing accessibility to your funds. These funds are federally insured by the National Credit Union Administration (NCUA) up to a total of $250,000 for all shares. Rates Effective: 2/1/2019. Rates can change monthly depending upon market conditions. There are transaction limits on the Money Market Account. During any statement period, you may not make more than six withdrawals by means of a draft (check), internet transfer or telephonic order/ instruction. There are no limitations on making deposits or withdrawals from the account in person. If you exceed the transfer limitations set forth above in any statement period, your account will be subject to closure. If you choose to use drafts(checks) on the account, your first book of 40 checks will be free. 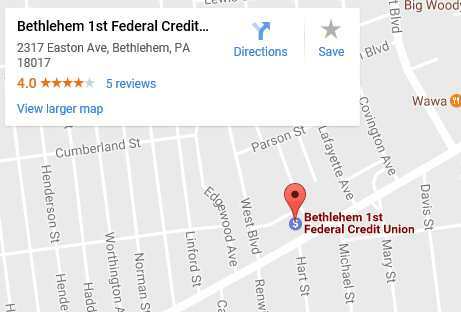 Ask any teller at the Credit Union or call us at 610-691-0041 to learn how you can open a Money Market Account at Bethlehem 1st Federal Credit Union.